Les arboréalistes ont le plaisir d'annoncer qu'ils ont été invités à organiser une grande exposition en France au Musée Collégial Sainte-Croix à Loudun. 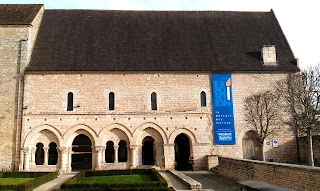 C'est un très grand musée qui permettra à chaque artistes d'exposer plusieurs œuvres. Tim Craven, conservateur principal du mouvement Arboréaliste, s'est rendu au Musée pour rencontrer le conservateur en juillet 2017 avec les artistes Guillaume Brandy et Francis Dalschaert. Il a estimé qu'environ 90 œuvres occuperont l'espace d'exposition. L'exposition sera présentée du 9 Mars au 28 Avril 2019. 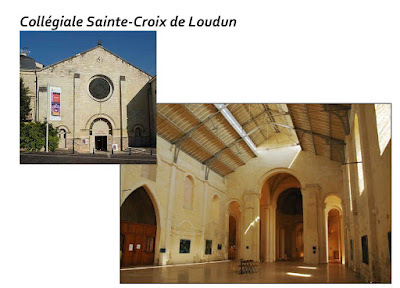 The Arborealists are delighted to announce they have been invited to stage a major exhibition in France at Musee Collegiale Sainte-Croix in Loudun. This is a very large museum and will allow for each Arborealists to exhibit several works. Tim Craven, Senior Curator of the Arborealist movement visited the Museum to meet the Curator in July 2017 with the artists Guillaume Brandy and Francis Dalschaert and estimated that approximately 90 works will fill the exhibition space.The exhibition will run from 9 March - 28 April 2019. 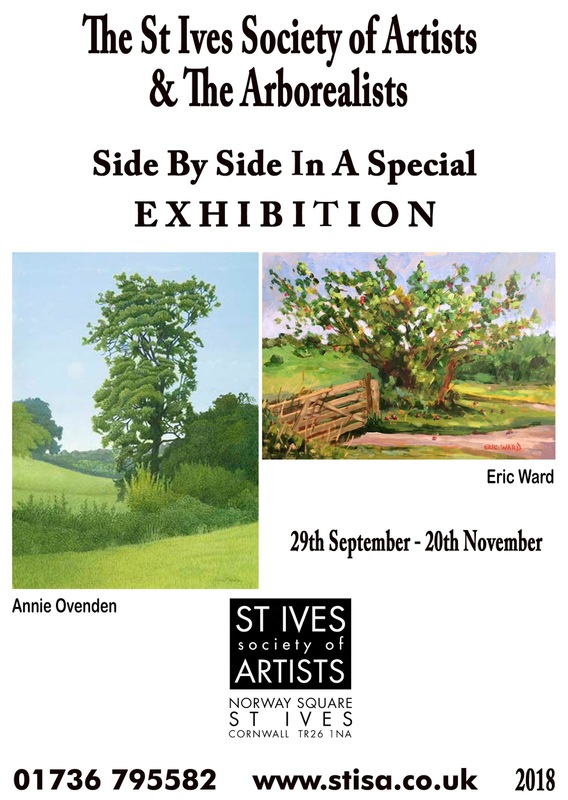 We are delighted to have been invited by The St. Ives Society of Artists to exhibit in The Mariners Gallery from 29th September 2018 for seven weeks until 20th November. Some of their esteemed members will be joining the exhibition as guest artists when Arborealists will be exhibiting their work. St. Ives has always attracted artists to its rugged charismatic coastline and harbour and is of course home to Tate St. Ives which will be opening its Autumn exhibition during the show. 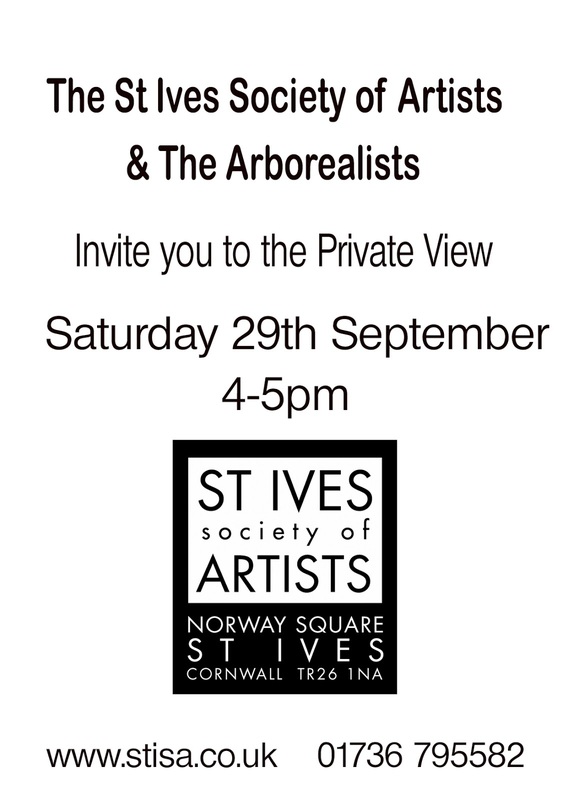 The private view will be held on September 29 4-6pm all welcome. At the beautiful and historic venue of Flatford Mill, famous for it's link to John Constable, the East Anglian Arborealists opened their show on the 1st September. Many thanks to Sarah Milne for all her hard work putting the show together- it is beautifully hung in The Boat House Gallery at this National Trust jewel in Suffolk. 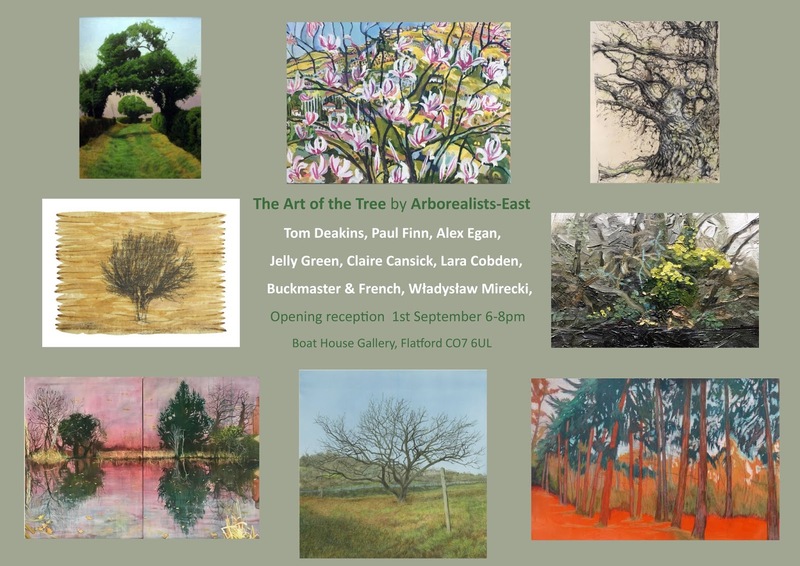 Arborealists residing in East Anglia are showing their artwork at The Boat House Gallery at the National Trust site of Flatford Mill, famous for being the subject of John Constable paintings, for example the Hay Wain or Boatbuilding near Flatford Mill among many others. 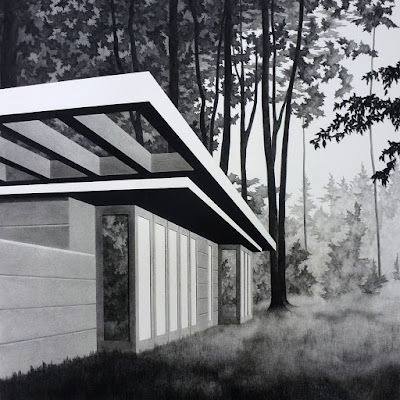 Exhibiting from September 1 - October 28 2018 are Arborealists Jelly Green, Tom Deakins, Wladyslaw Mirecki, Claire Cansick, Lara Cobden, Buckmaster & French, Paul Finn and Alex Egan. with an opening reception September 1 at 6pm. The largest exhibition to date of the Arborealists takes place this year at Black Swan Arts in Frome, beginning on the 21st July 2018 and running until 2nd September. 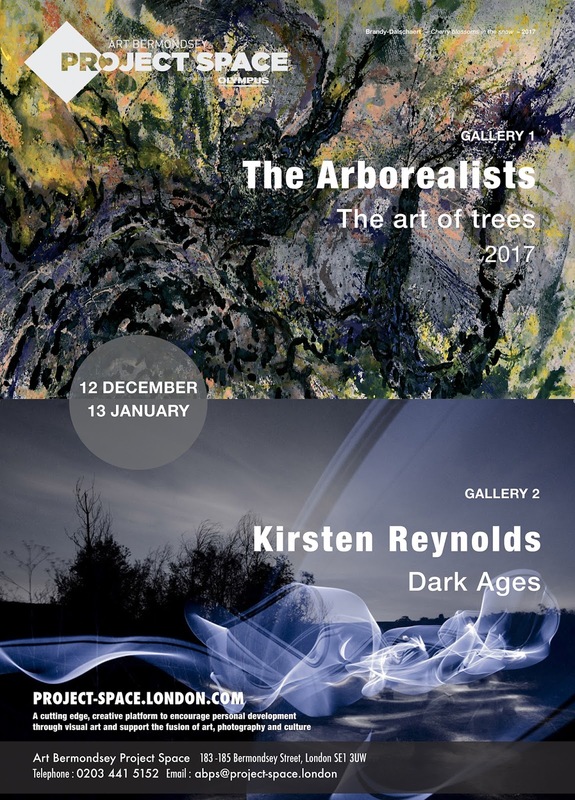 Fourty three Arborealists are taking part plus six guest artists who also explore the tree in their subject matter. This fantastic opportunity to show so many of the groups' talent and variety under one roof is an exciting prospect. With two large exhibitions spaces Black Swan Arts began life as an inn and was saved from dereliction and opened as an arts venue in 1986, it's crowning glory a wonderful round tower with two floors. 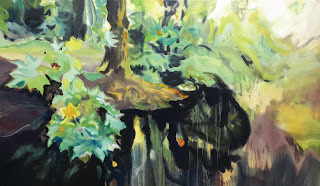 The Arborealsist exhibitions fills the whole venue and was expertly hung by Tim Craven, Philippa Beale and Paul Newman. Artist talks will take place by some of the group on Sunday 5th August, coinciding with The Frome Independent, a hugely popular specialist street market which takes place monthly in the town. The artist talk session is a ticketed event with tickets available from the gallery. 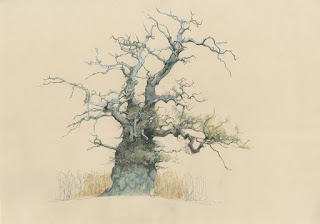 A selection of Arborealists from the West of the UK are taking part in an exhibition at the Ludlow Twenty Twenty Gallery during Part II of their Summer Exhibition. Showing from 10 - 28 July 2018 are Arborealists Karen Bowers, Simon Dorrell, Blaze Cyan, Fiona Macintyre, Celia De Sierra, Sarah Harding and founder Tim Craven. They will be joined by esteemed local artists Jo March, Michael Johnson and Melissa Scott-Miller for the duration of the exhibition. 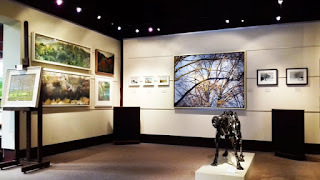 Twenty Twenty Gallery is a contemporary art gallery with an excellent reputation for British art and craft based in Much Wenlock, Shropshire and since September 2017 at Ludlow. The gallery is owned by Hugh and Mary Elliott who took over the gallery in 2004. Twenty Twenty has become a destination for customers looking for original contemporary art and craft in the West Midlands. Opening times for the Ludlow gallery are Tuesday - Saturday 10.30 - 4.30pm Closed Sunday, Monday and Bank Holidays. 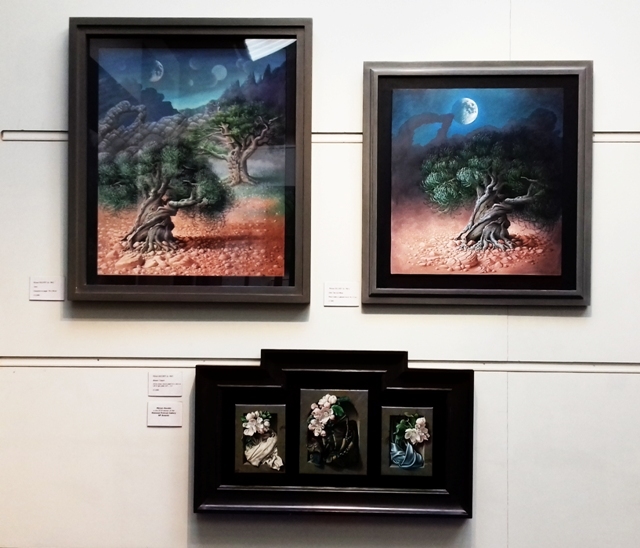 John Davies Gallery will be hosting an exhibition of the Arborealists from 7th July 2018 running for three weeks until 4th August. 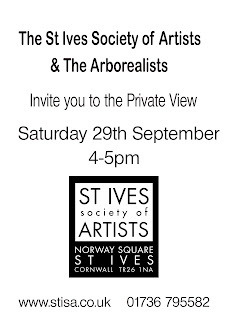 Twenty two Arborealists are taking part and will be joined by five guest artists local to the area. The large gallery gives a wonderful opportunity for an extensive exhibition which will include large works and will showcase the wide variety of styles and approaches to the representation of the tree within contemporary art. As we become more and more aware of our human impact on the environment our reflection of the natural world increases in value as we strive to bring attention to the protection of its beauty and importance to our wellbeing. The exhibition promises to showcase the importance of the tree within this ethos and is a great opportunity which we warmly thank John Davies for. The Arborealists are delighted to have have been invited by both Exmoor and Dartmoor National Park Authorities to create site specific works based on their ancient and managed woodlands. 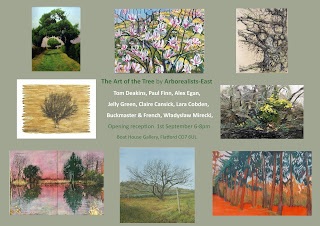 The first visit by a group of Arborealists takes place at the end of April 2018. Environmental campaigners believe that the majority of the population feel unconnected to nature and that there is no simple solution to this problem. We have become separated from our primordial roots and our once instinctive reliance on the cycle of life of our native flora and fauna. Many of us do not see ourselves as part of nature and so we do not understand or even care that we depend on the health of the natural world for our survival. It is recognised that doom and gloom reports of wild-life extinction and the destruction of vital environments can have the opposite effect to that intended. We readily accept a depleted state of nature as a baseline that continues to creep; biodiversity is slipping away without being noticed. We refuse to accept or digest the evidence and we bury our heads in the sand. There is a consensus however that fostering some kind of personal connection to nature is vital in order to awaken and mobilise a largely urban population to take action, and that this could include spirituality and the arts as well as science. 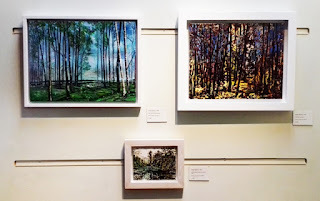 The project will draw directly on this premise and the Arborealists will visit specific tree and woodland sites on Exmoor and Dartmoor in different seasons and make new work for a special exhibition. order to amplify awareness of them as a natural resource of especial value. To compare and contrast the diverse ecology and environments of the different sites through works of art. To disseminate and promote the related ecological, historic and social research of the sites and thus their value, through the content of the exhibition and accompanying, interpretive texts. To highlight the threats to the sites such as neglect, degradation and climate change in order to encourage behavioural change in people who visit and enjoy the national parks. To celebrate and promote the precious and unique environments of Exmoor and Dartmoor. Relevant officers of Exmoor and Dartmoor National Park Authorities will identify and provide information on 4-6 tree and woodland sites on each moor of special ecological and historical significance. Information and access details for the sites would be made available for the artists. 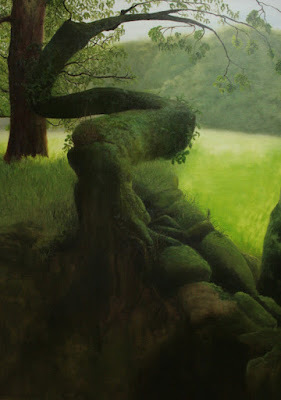 The project will be advertised to the Arborealists and guest local tree artists of significant reputation. Artists will sign up to the project and select from the proposed sites. It is envisaged that an appropriate spread of artists and sites will be established, with each artist selecting one or more sites. The Arborealists will share accommodation on specific long weekends in the spring and autumn of 2018 (and possibly 2019) and make preliminary or finished works of art at the sites. Artists may choose to work individually or in groups or return to the sites at other times. 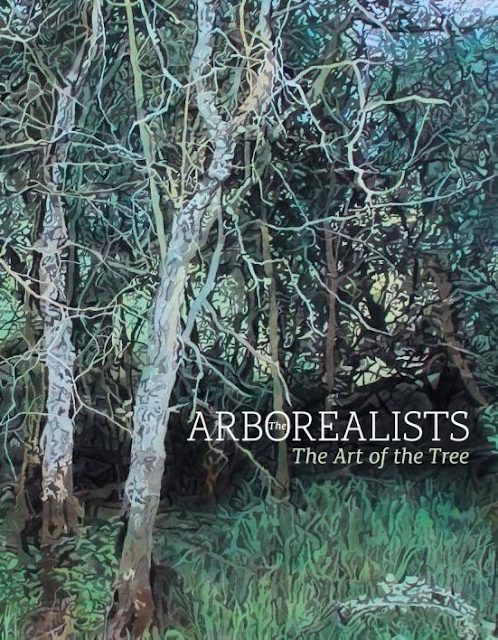 A community spirit and shared experience is part of the Arborealists' ethos that helps to develop art practice through cross-fertilisation. The National park Authorities will provide wall texts to accompany the exhibition, each of about 3-400 words, describing the ecological, historical and social significance of the sites represented. The National park Authorities will assist the Arborealists in promoting the project and exhibition through regular channels such as website, social media, literature and festival programmes as appropriate for maximum publicity and footfall. The project may grow to incorporate other art forms such as film and photography, poetry, literature, sculpture and music. These avenues will be explored as the project develops. Related events such as artists’ and ecologists’ talks, workshops and guided walks to the sites may be incorporated as part of the project. The project may, depending on available funding sources, be recorded in a publication to accompany the exhibition. This would further disseminate the aims of the project and assist in its interpretation and act as a legacy. Seeds have been sown for the Wye Valley River Festival 2018. There are whispers in the woods of the dates being 5th - 19th May 2018 and TREES being the theme. 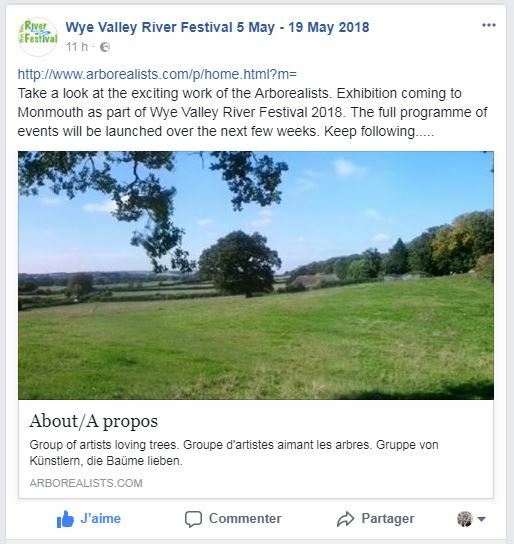 As the sap quickens and the branches grow watch Wye Valley River Festival 2018 and the Facebook page for more details. Twenty of The Arborealists met at The South Bank Centre on November 17th 2017 for their Annual General Meeting. Their agenda was to discuss past events and their success, to welcome new members to the group and to look forward to future planned exhibitions and proposals. An energetic and enthusiastic discussion was held, presided over by Tim Craven who introduced new members who were in attendance. 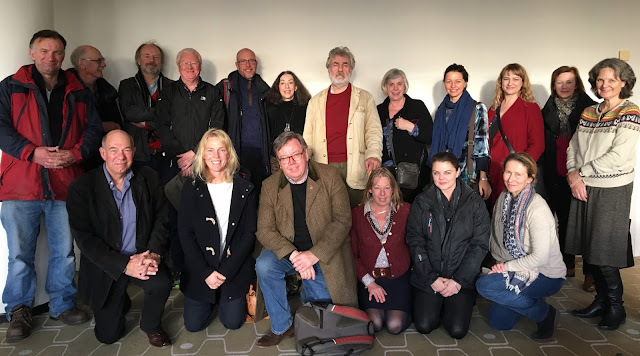 The group has grown to 57 members, and continues to expand with all members offering unique skills and experience which are essential to their ethos, ecological concerns and professionalism. The next twelve months include five forthcoming exhibitions across the UK and France with the continuing development of future projects. Fondé en 2013 au Royaume-Uni, le groupe 'The Arborealists' rassemble aujourd'hui une cinquantaine d'artistes internationaux réunis par leur intérêt commun pour les arbres, pour leur représentation et leur préservation. Ils organisent régulièrement des expositions Outre-Manche et présentent pour la première fois leurs travaux en France à Saint-Benoît.